A strong medicine type ball, Cyclone BallTM has a thick rope running through its core that extends into a handle for the user. 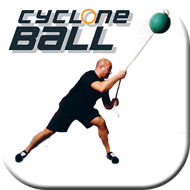 Cyclone BallTM is tough, durable and provides a challenging workout - great for rotation, power and core stability training. AOK's Cyclone Ball is available in 1,2,3 and 4 kg weights. The AOK Cyclone BallTM rope is a premium quality double braid nylon rope (20mm), also known as "Yacht Braid". They are constructed of a hollow braided rope, which acts as a core inside another braided rope. The combination of the 2 ropes in 1 results in a rope with a torque free construction and a higher tensile strength than is commonly found in twisted ropes. They have excellent flexibility and handling characteristics.